Now available for the Fall and Winter season, a stylish fashionABLE scarf handpicked by Jewel! 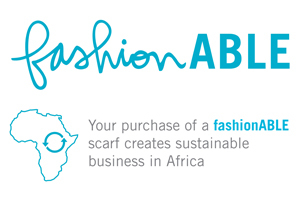 The fashionABLE mission is to create sustainable business for Africans so they aren't dependent upon charity, but instead earn the dignity of a job. Born out of Mocha Club's Economic Freedom project, they offer opportunity to everyone, with a primary focus on empowering women. When fashionABLE invests in a woman, statistics demonstrate that she will have a life-changing impact on her family and community... and herself. Official Shirt of Jewel's EDA Texfest 2011! Features all confirmed guests for April 17th show first and last names on the back! Blue, lightly distressed Stronger Woman blue babydoll tee. Soft, 100% cotton Hyp tee with image of Jewel on front with 38 tour stops in script on back. Soft, brushed cotton, crew neck, fitted, Women's Tee comes in a smooth chocolate brown. Soft, feminine, baby blue accented filigree surround Jewel's name and the Perfectly Clear Acoustic Tour title in a deep goldenrod yellow. Blue, lightly distressed Stronger Woman blue unisex tee. Soft, 100% cotton Hyp tee with image of Jewel on front.